All of us began this "pursuit of the rose" somewhere, but for those who only know a rose as the cut flower from the florist, we realize our web catalog can be somewhat overwhelming. 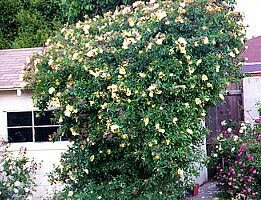 So...if you'd like to try growing some roses in your garden, but don't know where to start, this page is for you. We will give you step by step instructions to help you determine which roses are right for your situation. Following the steps in order will narrow the field as you go, but you'll still have to do some research on your own, either in personal visits to rose gardens, or via books, catalogs or the internet. Since our availability for consulting is limited we highly recommend that you join your local chapter of the American Rose Society or the Heritage Roses Group in order to learn from others who are further along the journey and happy to help. We have yet to meet any rose grower who does not enjoy talking about his or her own experience with the Queen of Flowers! Step 1: Know your Agricultural Zone. Click on our link here to determine your zone. This chart is based on your average lowest winter temperatures, and since different classes or varieties of roses survive different winter conditions it's necessary to know this information so you won't buy a plant that won't live past your first year (unless you're willing to grow them as annuals, as some people do). You can also use this link to go to Garden Web's zone finder that asks for your zip code. Step 2: Know Your Sun Exposure. No rose will grow and bloom in total shade or indoors. The only kind of rose for those situations is one in a vase. Step 3: Know Your Planting Area and Growth Habit Preference. Decide how large a space you want to plant with roses, and how tall you want those roses to be. 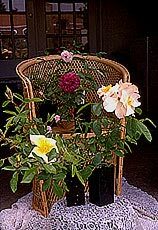 Roses come in sizes that vary from the smallest rose in the world (5-inch Micro Miniature Si, left) to a 30-foot Climber (Mermaid, below). Approximate height by width size at maturity (e.g. 4 x 3 ft.) of each variety will determine how many plants you can put into your available space. 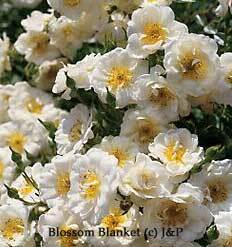 Also, knowing the growth habit of each variety (rambler, upright, mounded, weeping, shrubby, etc.) 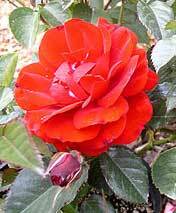 will help determine what kinds of roses will provide the look you want in your garden. Step 4: Know Your Flower Preferences. 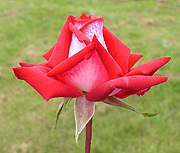 Rose flowers come in a wide range of sizes, colors, bloom form, bloom habit, and fragrance. The more you know about what you want, the easier it is to locate it in the 10,000+ rose varieties in commerce today. Rose blooms with 4 - 12 petals are called Singles, then there are Nearly Single, Nearly Double, Double, Fully Double, Loose, Pompon, Quartered, Flat, etc. Pictured at left, from the top left going clockwise, are Delicata (Hybrid Rugosa), Grüß an Teplitz (China), and Nevada (Shrub). What size blooms do you want? Nearly all rose flowers are between 1 and 5 inches in diameter. Typically the first blooms of the year on repeating varieties will be the largest with summer heat stress reducing the size in the next bloom cycle. 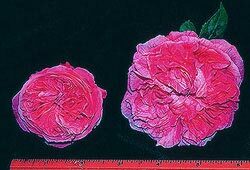 Shown here: Louise Odier on left (Bourbon), La Reine (Hybrid Perpetual) on right. How important is fragrance and what type of fragrance (fruity, myrrh, rose, tea, strong, damask, clove, musk)? Do you want the plant to rebloom all season long or have just one huge flush of flowers for up to 6 weeks (noted as "non-recurrent","once a year bloomers", or "one annual bloom")? Are stiff, long, upright stems important or is a nodding flower just as pretty? At left is the Old Garden Rose, Grandmother's Hat. Would you like hips or colorful foliage for fall color? Most Species and Hybrid Rugosa roses are well-known for their hips. This photo is of Ballerina, a Hybrid Musk. Do you want to plant own-root roses or grafted rose varieties? Armed with the above list of preferences you are now better prepared to shop. Check out some rose books from the library, take a stroll at a local nursery or rose garden, meet that neighbor who grows the one you want to have, talk to fellow rose group members, or spend some time on-line enjoying the many rose websites available, including www.HelpMeFind.com/roses . No one place will answer all of your questions so get used to the idea of researching multiple sources, along with getting some real trial and error experience in your own garden. It's all part of the process that makes rose growing such a fascinating and rewarding hobby. At this point you're ready to find mailorder suppliers for the roses you want to grow, or you can buy what's available at your local nursery. Depending on your zone and when you can work your garden soil, you can purchase dormant bareroot roses January-May or purchase plants shipped year round in pots of planting mix. Contact your mailorder nurseries early for the best selection as most take pre-orders for plants to be shipped later at your proper planting time. However you go about deciding what rose varieties you want to grow we wish you a most happy journey! 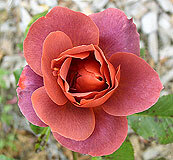 Copyright © 1997-2013 Amity Heritage Roses/Amity Rose & Garden Nursery™. All Rights Reserved.